Visteon's sales rose 24 percent in its most recent quarter on higher production in Europe and Asia. DETROIT -- As the dust settles on nearly 15 months in U.S. Bankruptcy Court, supplier Visteon Corp. hopes to take advantage of a recovering auto market, leverage its strengths and streamlined product portfolio, and put to work the expertise of a revamped corporate board. The U.S. Bankruptcy Court in Delaware approved Visteon's reorganization plan on Aug. 31, including a $700 million exit financing package. The company expects to emerge from bankruptcy protection by Oct. 1. The supplier shed most of its U.S. manufacturing plants and some in Mexico, including selling off its climate controls plant in Connersville, Ind. ; a plant in Saltillo, Mexico; and one in suburban Detroit to Johnson Controls Inc. and its Mexican subsidiary, Johnson Controls Automotriz Mexico, S de RL de CV, in an April deal. Over the past eight months, Visteon also divested ancillary product lines to focus primarily on interiors, electronics and powertrain controls. Selling noncore divisions and pruning manufacturing capacity were good moves, said Kevin Marsh, partner at Angle Advisors-Investment Banking, of suburban Detroit. Visteon's sales rose 24 percent in its most recent quarter on higher production in Europe and Asia. But the company posted a net loss of $201 million on revenue of $1.9 billion during the second quarter because of $236 million in bankruptcy-related charges. J.D. Power and Associates lowered its U.S. automotive sales projections for the year to 11.7 million vehicles after a dismal August, from a full-year forecast of 11.8 million in July. But lower vehicle volumes present an opportunity for Visteon to thrive, Marsh said. “Flatness or a slow rising tide in auto production should allow Visteon to leverage its remaining assets very efficiently,” he said. Bankruptcy also has allowed Visteon to separate itself from its legacy as a Ford Motor Co. spinoff, experts said. Ford's former parts making operations were spun off from the automaker in 2000 to form Visteon. Since then, Visteon has sought to establish itself as an independent supplier, adding non-Ford customers to diversify revenue. It's not an easy task, as similar spinoffs -- Delphi Automotive from General Motors Co., Denso Corp. from Toyota Motor Corp. and Faurecia from PSA Peugeot Citroen -- can attest. During the most recent quarter, Hyundai Motor Co. and its Kia Motors Corp. unit represented 30 percent of Visteon's sales, while Ford was 27 percent. The new leadership slate for the company's post-bankruptcy board is a mix of old and new blood. 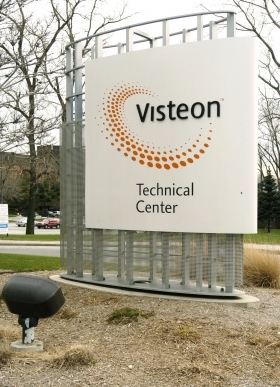 Visteon has confirmed four of nine board members: CEO Donald Stebbins; Karl Krapek, retired CEO of United Technologies Corp., of Hartford, Conn.; Herbert Henkel, former CEO of Ingersoll Rand, of Dublin, Ireland; and Mark Hogan, former president of Magna International Inc., of Aurora, Ontario. Stebbins, Visteon's CEO since December 2008, will remain the top executive. Krapek was a member of the board before bankruptcy. Henkel and Hogan represent new faces, but both spent many years leading suppliers. Henkel had been CEO of Ingersoll since 1999 before retiring this year. Hogan was Magna's president from 2004 through 2007. “It's very important to get a fresh look with senior management experience on the board after bankruptcy,” Francis said. Five additional board members will be appointed soon. Visteon's emergence from bankruptcy after 15 months marks a new chapter for the former Ford parts unit. The company initially sought court protection in May 2009 in the middle of the deep recession and frozen credit markets. GM and Chrysler also were navigating through Chapter 11 at the time. Visteon owed lenders $1.6 billion and bondholders $870 million during bankruptcy, and the odds of its survival were questionable. In May, its board fought off an unsolicited $1.25 billion takeover bid by Johnson Controls Inc., of Milwaukee. “The difficult and necessary actions undertaken during this reorganization will allow Visteon to emerge as an extremely competitive automotive supplier,” Stebbins said in a statement. Bondholders -- including Goldman Sachs Group Inc. and hedge funds Oak Hills Advisors and Silver Point Capital -- prevailed in the end, offering up $1.3 billion to buy control of the reorganized company. Visteon shed about $2 billion in debt under Chapter 11, including deep cuts to retiree benefits. The cuts were under contention throughout Visteon's bankruptcy until the company agreed to pay $12 million to more than 6,000 retired workers in return for insurance and benefits concessions. “Bankruptcy has evened the scales,” Marsh said. Shareholders will receive 2 percent of distributable equity, according to court documents, plus warrants to purchase an additional 3 percent. Visteon ranks No. 21 on the Automotive News list of the top 100 global suppliers with worldwide sales to automakers of $6.42 billion in 2009.